Trauma Surgery & Acute Care Open is the American Association for the Surgery of Trauma’s open access journal dedicated to the rapid publication of peer-reviewed, high-quality trauma and acute care research. Trauma Surgery & Acute Care Open provides an interdisciplinary forum for global issues in trauma and acute care surgery and is dedicated to covering epidemiological, educational, and socioeconomic facets of trauma management and injury prevention. We urge our authors to provide several tweets as well as the Twitter handles of consenting co-authors and institutions that we can use to promote your work on Twitter. By supplying us with succinct, compelling posts, we can work to increase engagement with your research among your peers and bring it to the forefront of current conversations in the field. TSACO is pleased to announce that we now accept infographics to supplement original research. We strongly encourage all authors to consider presenting their research in this exciting, dynamic format. A template can be found here; additional instructions can be found on the Authors page. 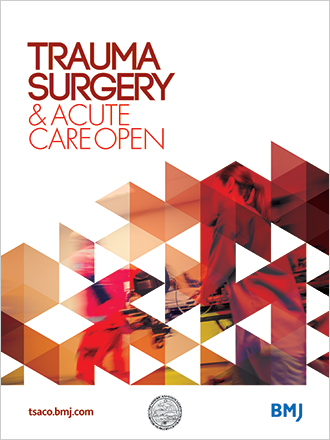 Trauma Surgery & Acute Care Open accepts submissions of a wide range of article types, including original articles, reviews and current opinion articles. The Author Information section provides specific article requirements to help you turn your research into an article suitable for TSACO. Information is also provided on editorial policy, Open Access fees and formatting. Rib fixation: Who, What, When? Copyright © 2019 The American Association for the Surgery of Trauma. All rights reserved.